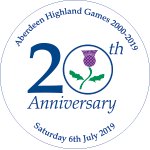 No event at the Aberdeen Highland Games encompasses such enthusiasm and colour as Highland Dancing and what better sight and sound can there be that encapsulates the very essence of Scotland than the bagpipes accompanying a kilted dancer, swaying and pirouetting to traditional airs! Highland dancing requires great flexibility, agility, timing and stamina to precisely execute the intricate footwork, which makes the dance style so unique. You will see them perform many classic highland dances including The Sword Dance, the Highland Fling and the Seann Trubhas. This mixture of Scottish dance and music always makes the highland dancing a crowd favourite which shouldn’t be missed. As well as the Highland dancing there is the more social form of Scottish dancing. Scottish Country Dancing is done in sets, typically of three, four or five couples, arranged either in two lines (men facing ladies) or in a square, and involves the dancers dancing a sequence of set formations enough times to bring them back to their starting positions. Its always great fun and you’ll have plenty of chances to try it at the Ceilidh.